BUFFALO, N.Y. -- Buffalo State senior Wilfried Folaranmi and May 2018 graduate Lilly Inglut recently shared what they gained from traveling to Rwanda as part of the Anne Frank Project (AFP) in an interview with WKBW-Channel 7 reporter Josh Bazan. 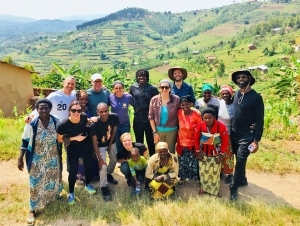 Earlier this month, Folaranmi and Inglut joined nine other Buffalo State students and Drew Kahn, SUNY Distinguished Service Professor and AFP director; Eve Everette, AFP assistant director; and Alice Pennisi, associate professor of art and design, for the two-week trip to the East African country. They described it as life-changing, humbling, and inspiring. Since 2011, Kahn has accompanied a small cadre of students to Rwanda to spread AFP’s social justice message and story-building theme. The mission has expanded to include training Rwandan classroom teachers on engagement techniques to use with their students. As both Folarnami and Inglut explained, the AFP contingent learned just as much from their hosts as they taught.